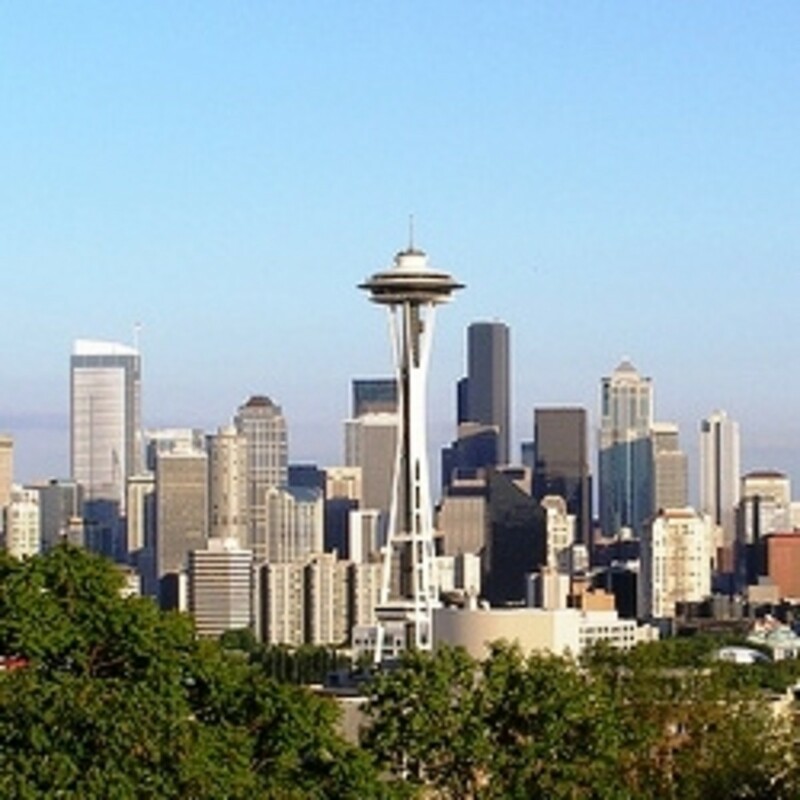 The Seattle Puget Sound region of the country offers so many vacation spots it's hard to decide where to go and what to see first. However, if you want to experience the best vacation spot in the Seattle area, check out San Juan Island. San Juan Island is one of the San Juan Islands located just west of Anacortes in the northern part of the state. There are more than 11 islands but the 11 largest are the ones most people talk about when speaking of the islands. San Juan Island is only reachable by the Washington State Ferries system, private boat, charter boat, seaplane or plane but it is well worth the effort to take a trip to this beautiful place. San Juan is the second largest of the San Juan Islands and the most populated but the other islands are well worth a vacation trip as well. San Juan Island offers unique recreational activities as well as many different tours. There are also many other amenities for anyone to enjoy and if you're looking for a relaxing and memorable vacation, a trip to Friday Harbor on San Juan Island is the ticket. Let's take a look at the island and the many things there are to do on San Juan Island. We'll also get a flavor of the other 10 larger islands as well just for future reference! San Juan Island was actually named after the expedition by Francisco de Eliza in 1791 but was named and renamed several times as several other explorers discovered and rediscovered it. The Spanish name finally became its permanent name as it was listed on the British charts as San Juan. On San Juan Island, there are 2 abandoned military camps; the American Camp on the south side of the island and the English Camp on the north side of the island. These camps came to be as the result of the so-called Pig War. 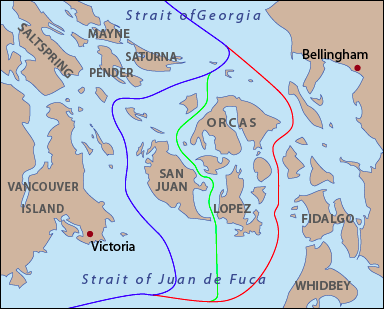 There was a discrepancy in the English boundary for the San Juan Islands and the American version of that boundary. Tensions began to rise over the boundary and the 2 factions almost came to blows over it though the border dispute ended up being tabled while each country held its ground. However, the incident came to a head when a US settler shot a pig that was raiding his garden. The pig happened to belong to the Hudson's Bay Company and although the man offered to pay for the pig, this set off the infamous Pig War and lead to the establishment of the 2 camps in 1859. Although there were the American and the English camps, nothing came of the conflict except a few skirmishes here and there (and the squabble over how much the pig was actually worth because he was of such good breeding stock). The British abandoned their camp in November 1872 while the Americans left theirs in July 1874. The boundary was finally settled in October 1872 after the US and Britain signed the Treaty of Washington in 1871. Kaiser Wilhelm of Germany ruled on the matter and decided in favor of the United States, establishing the boundary through Haro Strait. San Juan became an American territory and the boundary between Canada and the United States was set. Now the American and English Camps are a US National Park, their history being that they were occupied for 12 years in the 1800s. The English Camp has formal gardens and is very well maintained while the American Camp at the south end of the island is beautifully open, more windswept and has more of a beach atmosphere. Both camps have wonderful hiking trails and were designated national historic landmarks in 1961, listed on the National Register of Historic Places in 1966. Both are fascinating places to visit and ripe with history of the island. You can also occasionally find an archeological dig in progress as well. The San Juan Islands are a group of many islands but 11 main islands make up most of what is known as the San Juan Islands. Some of the tiniest of islands are named as well. The San Juan Islands make up San Juan County which encompasses the very northwestern tip of Washington State. There are really 4 major islands that are vacation destinations, though you can visit the other islands by charter or private boat and some do have landing strips. The rest of the San Juan Islands can best be characterized as being mainly off the beaten track and not as popular when it comes to tourism, although some of these smaller, less traveled islands have their draw as well. In my opinion, getting to San Juan Island is half the fun. 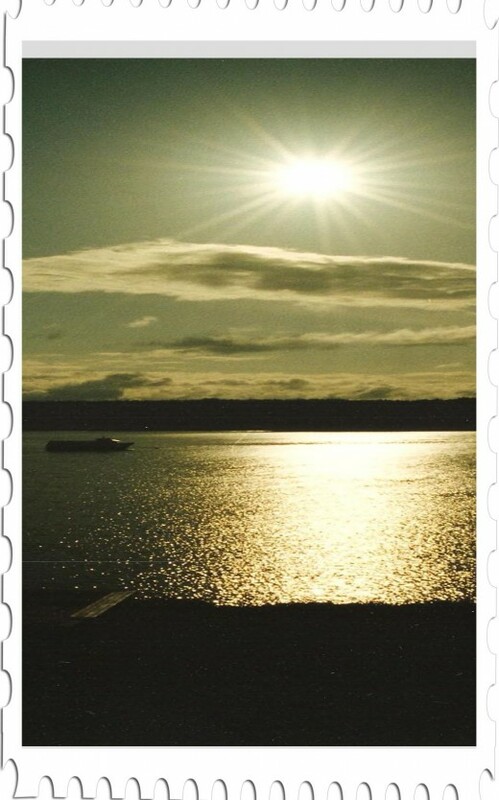 My entire family has always loved the fun of taking ferry rides and ferry rides in the Puget Sound region are some of the best around. The Washington State Ferries system is great about being on time and as many times as we've traveled on the ferries, we've never had any problem getting to and from our destination as planned. That being said, it is important to note that the Washington State Ferries system advises that you arrive at the ferry dock and get in line one hour before the ferry is set to sail, especially in peak seasons such as summertime. We always took things like a Frisbee, balls, crafts or something to occupy the time while we were in line. Once you park your car in the ferry line, you can get out of the car and go inside to the terminal and eat, use the facilities, or just beach-comb while waiting for the ferry to dock. I always look at the ferry ride as the prelude to my vacation or time away at the island. It's a time to spend reflecting on what you want to do when you get to the island and it's also a great time to start decompressing and lull yourself into 'island time' or relaxed mode. Likewise, I've found the ferry ride itself to be very relaxing. The ferry from Anacortes is the usual ferry route to take to San Juan Island, although you can take an inter-land ferry from the other islands. 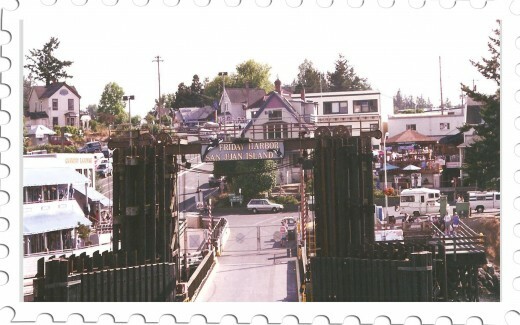 You also can take a ferry from Sidney, British Columbia into Friday Harbor on San Juan Island. The ferry trip from Anacortes is just over an hour but you won't be bored. The views are spectacular and the pace so relaxed that you can't help but be calm and serene when you reach the island. If you leave from Anacortes, your ticket is actually one-way but it includes your round trip passage back. 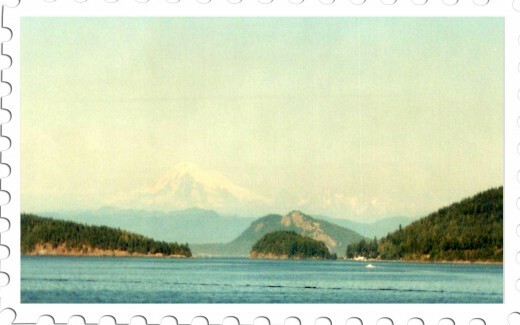 The Anacortes ferry terminal is about 80 miles from Seattle by way of I-5 or 405. Anacortes is a great little town to explore as well. 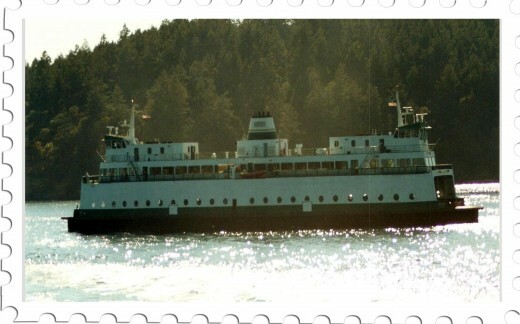 There are multiple departures daily for San Juan Island and the place to check is Washington State Ferries. A ferry ride isn't the only way that you can get to the island though! You can fly in by booking with companies such as Kenmore Air, Northwest Sky Ferry or Westwind Aviation. The Victoria Clipper also sails from downtown Seattle and is a great way to go. We traveled to Victoria, British Columbia on the Clipper and it was wonderfully relaxing with no worries about traffic or getting to the ferry terminal on time. Amtrak also has passage available to Mt. Vernon which is the closest train station to Anacortes. You can arrange to take the train, grab a shuttle to the ferry terminal complete with tickets and off you go. 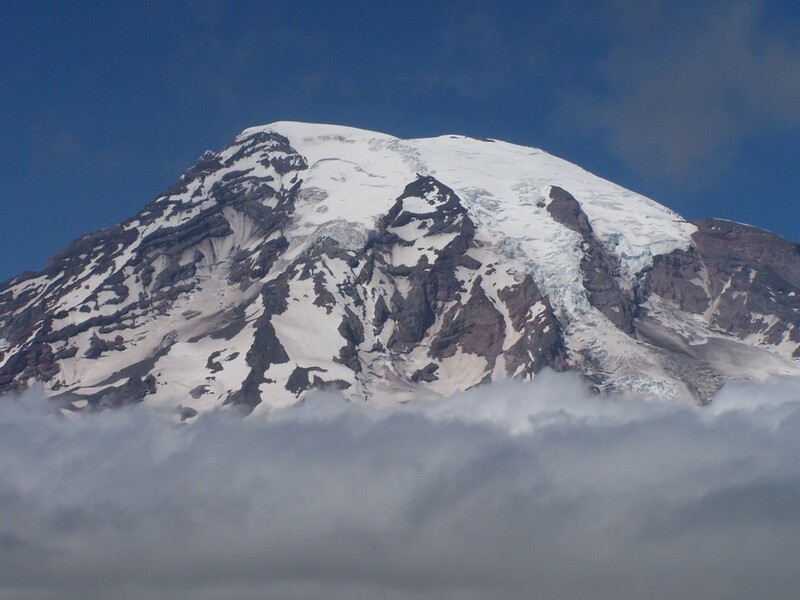 Even Greyhound Bus Lines goes from Seattle to Mt. Vernon. There, you can transfer to the Skagit Transit system and route yourself to the Anacortes ferry terminal. For inter-island travel, there are also water taxis and charter planes or boats available for hire on the islands. Last but not least, you can sail your own boat from just about anywhere and arrive at any of the island docks. If you plan on seeing Canada as well (because they are just across the strait), make sure you travel with your passport. There is an international ferry and you can see 2 countries instead of one! Accommodations on San Juan Island are a dream come true. Perhaps that is one of the reasons that it's such a popular destination vacation spot. In peak seasons (from about May to September), it is recommended that you always have reservations booked ahead because it is sometimes tough to find 'room at the inn' even at the campgrounds as they can be booked up to months to a year in advance! Luckily, though there are many ways to stay on San Juan Island and it's simply a matter of finding what kind of accommodations most fit your budget and your lifestyle. You can go from the low end such as camping to the high end such as staying at Roche Harbor and other venues on San Juan Island or Rosario's located on nearby Orcas Island. Lakedale Campground is a great place to stay and they have just about every type of accommodation you can imagine available. Located on the east side of the island, we've camped at Lakedale Resort as well as spent many days at the 3 lakes contained on the property fishing and boating. The campsites are spacious and the shower facilities are wonderful. Since we've been to Lakedale, they have also moved to the next level and now offer 'glamping' which is the latest rage in camping. Instead of using your own tents, you can rent a canvas tent that comes with a queen-sized bed and pull-out sofa sleeper along with other comforts of home such as more furniture! 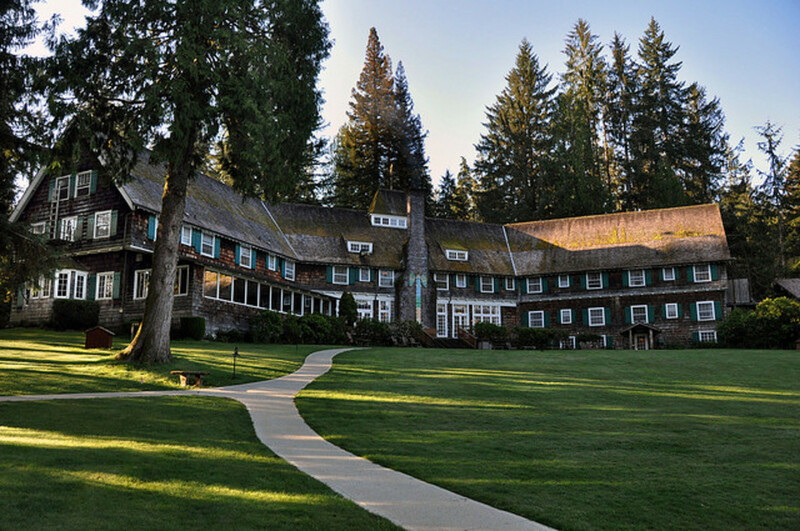 There is also the Lodge which was rated as Best of Northwest Escapes in the Evening Magazine 2010 contest. You can also rent a 3-bedroom house if you have a large group coming and enjoy all the comforts of home with all the amenities. We rented a cabin at Lakedale for my sister's birthday and it was absolutely beautiful. It was right on the lake and had its own little veranda outside as well as a full kitchen, 2 separate bedrooms and baths and a pull-out in the living room. It was more than enough room for all of us and it was such a nice and cozy way to spend a weekend! The cabins are even dog friendly and they permit up to 2 dogs per cabin. There is no restaurant on premises at Lakedale, however, so in-town is your best bet for dining out unless you have full cooking facilities such as in the cabins or the private house for rent. They do offer continental breakfasts though and in the cabins, you can have them delivered right to your door. 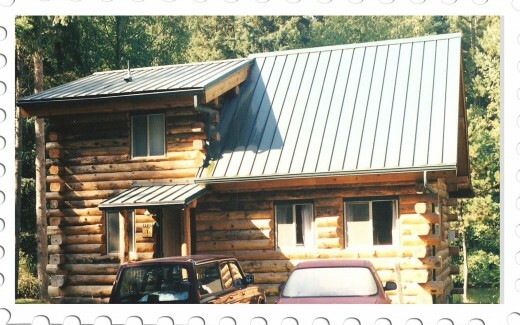 On our first trip to San Juan Island, we stayed at the Mar Vista Cabins which is on the west side of the island. It too had a full kitchen and 2 bedrooms with a pull-out in the living room. We stayed for a week and had a marvelous time being so close to the west side of the island where the Orcas most usually are seen. We also tried our hand at fishing though it was rather treacherous and would recommend sticking to the lake or a quieter beach! There was a marvelous path that went from the cabins right down to the beach and the week was one we'll not soon forget. 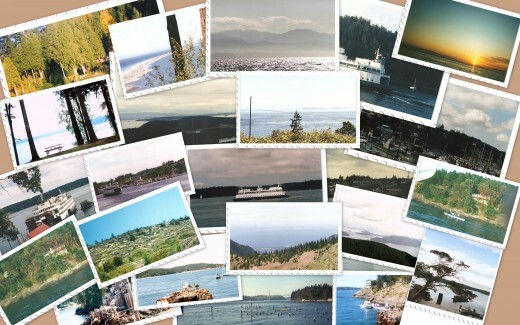 Further up at the top of the island you will find Roche Harbor, which is a world unto itself. Roche Harbor is a sheltered harbor on the far northwest side of San Juan Island and is a beautiful resort. Roche Harbor even has its own small airport and the marina is a port of entry for pleasure boats. It is considered to be one of the best marinas in the Western United States. Roche Harbor has all manner of accommodations from condos to the beautiful Hotel de Haro, which is the centerpiece of the resort. It was built in 1886, is listed on the National Register of Historical Sites, and is a must see even if you aren't staying at the resort. There are also cottages and units called Village Homes with fully equipped gourmet kitchens and lots of space for families. For dining, check out McMillin's, the Madrona Grill or the Lime Kiln Cafe all right at Roche Harbor. Again, worth a trip in just to have a snack, breakfast, lunch or dinner! In addition to the above, there are countless B&B's, private rental vacation homes on both sides of the island as well as mid island, and there are condos and suites available right at the ferry landing that are gorgeous and well appointed. You can pretty much stay anywhere your budget allows and find something that is topnotch and just what you need to enjoy your time on the island. If you're looking for chain stores, you won't find any on the island. In fact, it's always wise to think ahead as to what you need to bring though the island is not by any means lacking in places to buy supplies. You just won't have as much variety probably as the island is a contained community and they can't compete with large chain stores. In town, there is a marvelous market with just about everything you could want or imagine called the Kings Market. That is usually where we do all of our shopping, even when we come over on a day trip. 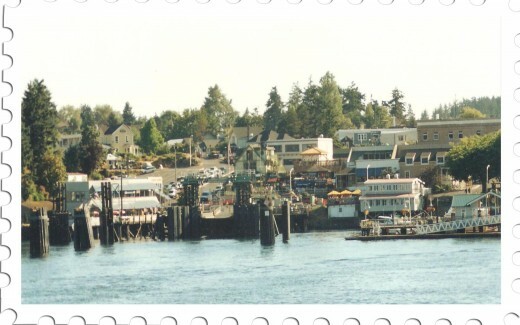 There are several other small markets and some markets on Orcas, Lopez and Shaw as well. From May until October, check out the Farmer's Market for the freshest in produce on San Juan Island as well as things like herbs, homemade goodies, etc. There is an herb farm outside of town on the island. There are bakeries in town and you might want to stock up on goodies for a picnic or back at the campsite or cabin! Many artists live on the San Juan Islands and all of the islands are famous for their wonderful artwork and crafts. There are plenty of little stores and shops to keep you busy for days browsing for those special mementos you want to take home. We always leave San Juan Island with many whale mementos because we are all partial to the Orcas. You can buy things from tee shirts to carvings to artwork. A particular favorite of the kids on-island for a visit are the Orca whale stuffed animals. My daughter still has hers from a billion years ago. You can buy toys and games at a couple of the local stores to keep the kids and yourself busy and you can also buy a kite to go fly on the beach. There is also a pet store in town so if you have Fido with you and need supplies, you're set. Clothing and shoes are not a problem if you find yourself in need. There are plenty of stores in Friday Harbor to keep you outfitted for your trip. Bookstores and video rental places are also abundant for such a small community. There is also one newspaper available called the San Juan Islander where you can read all the local news. While San Juan Island is not a huge place and Friday Harbor is not exactly a metropolis, you'll find all you could need in this little isolated vacation spot and not have to fight the crowds to do it. There are so many things you can do on San Juan Island, it's hard to list them all but I'll give you some ideas. I only mention this first because it is one of the main reasons people flock to San Juan Island and why it is one of the most popular spots among the islands. San Juan Island is home to 3 pods of Orca and minke whales. They usually can predictably be seen with great regularity on the west side of San Juan Island from May through September. You can view the whales many different ways. You can go out on guided boat tours that are available right in Friday Harbor or on one of the other islands or you can go out on a kayak tour. People go out in their own private boats and kayaks as well. Just have a care as I know from experience that a sea lion can look like a giant sea monster up close and not sure how I'd react if I had actually seen a whale while I was kayaking. You can also take air tours and see the pods from an aerial perspective. There is also a wonderful park called Lime Kiln Point on the west side of the island which offers the best viewing of the Orcas, though my family and I discovered a place just south of that on a rocky outcrop and that is where we've gone for years to see our 'friends'. Wherever you go to see the Orcas, it is a life-changing experience. I think the combination of their beauty and magic is enhanced by the wide open strait that you see them in and if I think really hard, I can almost bring back that sound of their breathing into the ocean. It is mystical. Some tours will even give you a coupon to return on another day if you didn't get to see the whales! Make sure though that you read up on the protocol for whale watching as it has been documented that noise and activity does stress dolphins and whales. 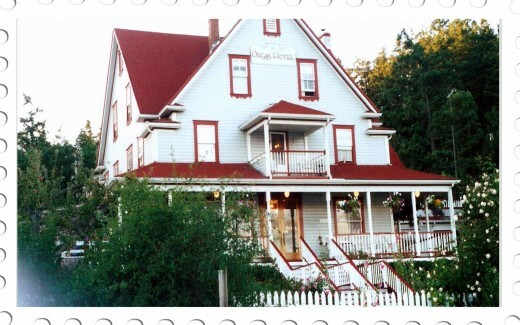 There are several museums on the island and most notable is the Whale Museum. You can even adopt a whale here which we have done. It is chock full of information and exhibits and is a bargain to go visit. There are also the great exhibits at the American Camp and the English Camp on the southern and northern ends of the islands respectively. Although Mt. Constitution is the highest of the mountains on the San Juan Islands (located on Orcas Island), Mt. Young is a climb! We've taken that hike and it is well worth it for the gorgeous view from the top looking out over the islands. As well as Mt. Young, you can hike on beautiful trails all over the island but some of the most notable are part of the American Camp and the English Camp. The American Camp trails will lead you down to a beautiful sandy beach where in nice warm weather, you can swim and then sit on the beach and just admire all that beauty. Bicycling is a huge favorite on all the San Juan Islands because of the slow pace. You can rent bikes on any of the islands and go for hours on roads that take you through some of the most beautiful countryside around. You'll see bald eagles swooping into freshly cut hay fields and you'll see cows lazily ambling over to the fence to stare at you. There is no end to the beauty on this island and the others. Camping on San Juan Island, we've met lots of people who were doing biking tours of the San Juans and take several weeks to see everything. It's a great way to see the islands. Kayaking is a huge activity in the San Juan Islands. You can rent kayaks if you didn't bring your own and if you need to rent them, you can get lessons and then go on tours to see the whales or just kayak between several of the islands. It's a beautiful part of the country to see by kayak and the whale sightings are breathtaking. This is another super popular activity on the islands. The water off San Juan Island is roughly about 40-45 degrees so it is advised that you take precautions when diving around the islands when snorkeling or scuba diving and always dive with a partner. San Juan Island has incredible underwater caves and reefs to explore and also boasts its resident The Pacific who is the World's Largest Octopus! Even in inclement weather (which usually is very short-lived on San Juan Island), the camping is a great experience. We've camped several times on San Juan and loved it. The nights are not too cold and the days are just perfect, usually hovering in the 70s to 80 degrees. There are many sites spread over the islands but our favorite has always been Lakedale Campground. You can purchase camping equipment on the island as it is a very popular pastime on the islands but best to bring your own and have reservations if you plan on camping out. RV camping is also very popular on the island but again, reservations are always recommended. You can pretty much do any kind of fishing you'd like on San Juan Island, from fishing on the beaches as we did while the salmon are running to fishing in the lakes that are on the island. You can also go out on fishing tours or charters and learn all about fishing and most likely, you'll be assured of catching something that way. For the folks that just can't get enough of golf, San Juan Island even has a golf course and a beautiful one at that. It's a 9-hole links style golf course that is set in the beauty that is San Juan Island. It doesn't get much better than this! It has a new clubhouse and is a great way to spend a few hours on a sunny day. There are tennis courts for public use at the high school and there are lots of great areas for picnics throughout the island. Some of the best are at Lakedale and some are at the local parks and beaches such as Cattle Point, Jackson Beach, Sportsman Lake and Eagle Cove Beach. San Juan Island even has its own movie theater. The Royal is a double screen theater. The San Juan Community Theatre is the performing arts center for the island. Many bars also have entertainment or karaoke. The Orca whales are by far the most talked about wildlife on San Juan Island and even some of the other islands because occasionally they do make an appearance there. The San Juan Islands have the K pod of Orcas which has roughly 17 whales and they also have the L pod which boasts about 50 or so. There are at least 15 minke whales that are resident to the area and gray whales are also known to pass through. Bald eagles are in great supply in San Juan County and in fact, there are estimated to be 89 pairs of them always in residence in the county, making it the most bald eagle populated county in the state. The state of Washington is also known for having the most bald eagles in the 48 states. Besides Orcas and eagles, on any given day, you'll see blue herons, rabbits, red foxes, deer, wild turkeys, golden eagles, ospreys, peregrine falcons, trumpeter swans and more. There are dozens of species of birds all over the islands. Out to sea, you'll see seals, porpoises, sea lions and otters. San Juan Island is a photographer's paradise and a bird watcher's dream come true. Don't forget your binoculars, your cameras, and your wildlife guides! Check on line if you are looking to do special events or bike tours. REI for instance has a great whale watching, kayaking, hiking and biking tour that you won't want to miss. The San Juan Islands are such a popular vacation/recreation spot that there are always special events springing up that are great to participate in while seeing one of the most beautiful scenery in the Northwest. You won't go hungry on San Juan Island! Friday Harbor House is a great place to eat right in the heart of downtown Friday Harbor and The Place Bar and Grill. Duck Soup Inn is a favorite of anyone who has ever eaten there and also a favorite of locals. The Front Street Cafe is a great stop-in experience and the Front Street Ale House is one of our favorites. There are many places to eat such as the restaurants at Roche Harbor and in-town. For a quick fix, try the San Juan Donut Shop or Felicitations Bakery. There are coffee shops and Internet cafes to choose from. There are Italian and Mexican restaurants if that suits your fancy. There are pizza and sub places if you're thinking quick and easy and there are delicious seafood choices. For an island, there are a tremendous number of dining and food services to please even the most discriminating palate! If a spa date is what you think of when you think of vacation, while you're enjoying the beauty that is San Juan Island, you will get your wish! The Afterglow Spa at Roche Harbor offers full spa services and there are also other local spas to meet your needs. Lavendera Day Spa and Spa D Bune can be found in Friday Harbor and for something out of the ordinary, check out Earthbox Motel and Spa. This is where spa meets a quirky San Juan Islands Hotel. You can lounge in their heated indoor pool year round, book spa services, and schedule moped rentals, do yoga, and sign up for wildlife tours or sea kayaking. Kind of a multipurpose spa and hotel! If you've brought Fido with you on your jaunt to San Juan Island, make sure that the accommodations are pet friendly, though many are on the island, including Earthbox. You can even take your well-mannered pet on the bus with you on San Juan Island. There are also many pet-friendly restaurants and cafes in town. Just always remember to check first. If not, you can kennel man's best friend at several of the local boarding facilities or dog sitting facilities such as Downtown Dog with its Bow Wow Bus (carrying dogs to a field on the other side of the island for a good romp). Or check out the Animal Inn which offers boarding including day boarding, grooming and medical care. Also for vet services, Islands Veterinary Clinic is a great place to take your pet. You can obtain medical services (emergency or non-emergency) at the Inter Island Medical Center on San Juan Island and there is Air Flight service available to the nearest hospital which is in Anacortes. There are also medical facilities available on Lopez and Orcas Islands. There are churches of many faiths on San Juan Island from Baptist to Catholic to Jehovah's Witness. Check the link above for listings and phone numbers. The San Juan Islands are part of the greater Seattle environs though the San Juan Islands just like Whidbey Island, Sequim and Port Townsend, Washington all enjoy this remarkable little enhancement to their weather called a rain shadow. You can bet on these statistics while the folks in Seattle and surrounding area are complaining about the rain. 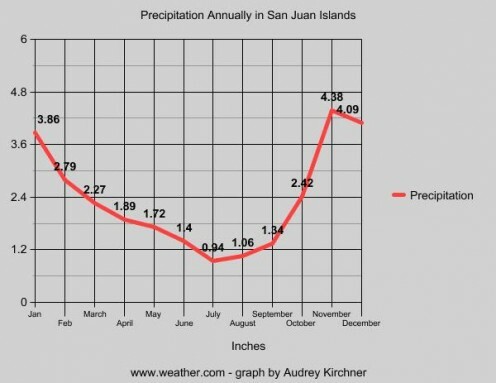 The San Juan Islands have roughly twice as many sunny days as Seattle and about half the amount of rainfall! 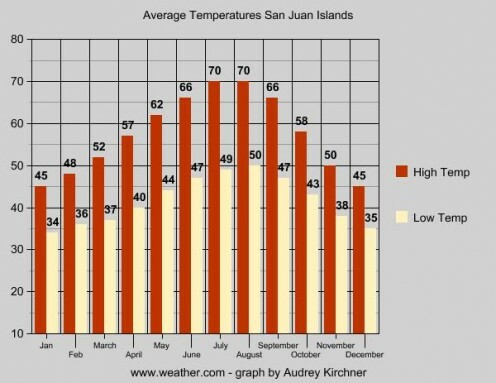 That makes San Juan Islands an incredibly lucrative place to go on vacation just about any time of the year to get away from the constant rain if you happen not to enjoy it and especially if you live in the Seattle area. 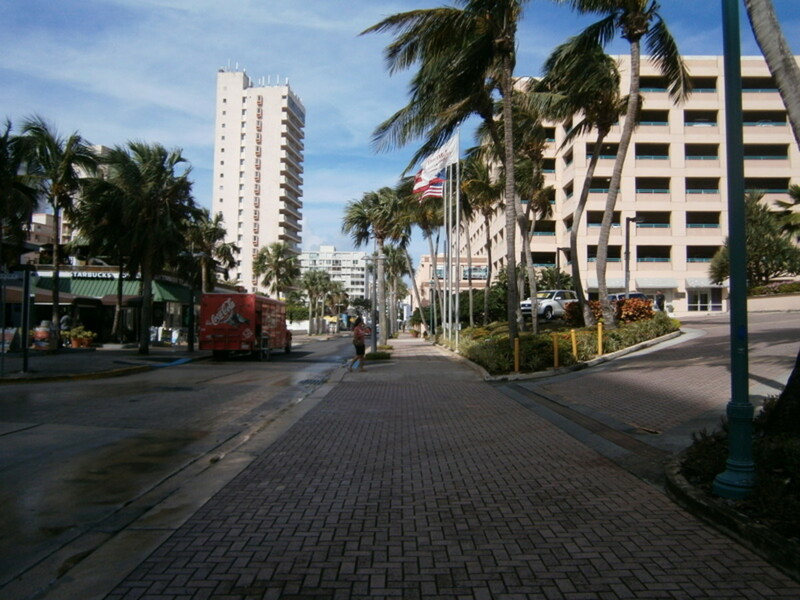 Daytime temperatures are usually in the 70s in the summertime and goes down to the 40s in the wintertime. Although the San Juan Islands have been known to be hit by a couple of incredible storms such as in 1996 where it snowed so bad that travelers were stuck on the island, most often you can count on the San Juan weather to be just what you need to enjoy a great vacation, that being warm and sunny. If you get a hankering to check out the other islands, great trips are adventures on Orcas, Lopez and Shaw islands. Or you can charter a boat or plane trip to the other islands and do a bit of island hopping to see all that is out there to see. No matter where you go on the islands though, you can't help but enjoy the beauty of your surroundings and the peace and quiet of island life. Orcas and the other 2 islands are very well known for their camping sites and also are popular spots for biking and hiking. Each of these 3 other islands has much to offer and are as wonderful to visit as San Juan Island. Many local artists have shops and things for sale on these other islands as well so it is well worth a jaunt to one of the other islands for at least a day trip. There are also great places to eat on these islands and great places to stay like the Orcas Hotel and the Rosario Resort. San Juan Island is a magical vacation destination. You won't ever see the same thing twice and you'll always feel like you had a truly relaxing and wonderfully peaceful vacation. Some people like to stay at many places and see a lot of things when they go on vacation while many other people like to go to one place and just stay there for the duration of their vacation. Whatever kind of vacation traveler you are, you won't be disappointed in this fantastic part of the great Pacific Northwest. Whether you are looking for a quiet peaceful spot to spend a week or a weekend, or you're looking to do a tour of Canada and a bit of the Pacific Northwest and you don't mind picking up and moving every day, this is the spot you'll want to visit. There is nothing quite like the San Juan Islands and San Juan Island has it all. We have taken many day trips to San Juan Island and would do it in a heartbeat. Our drive was a bit further because we lived 45 minutes south of Seattle so we had a several hour drive, then a 1-hour ferry ride before we arrived on the island. We've taken everyone who has ever visited us to see the island and the Orcas because it is one of those experiences you just never forget! Wishing you a wonderful trip to one of the most wonderful places the Northwest has to offer and hoping with all my heart you get to see my favorite creatures - the Orca whales! Definitely a place worth visiting and staying a while~ If you visit, make sure you swing by my place too....the best "B&B" around~ Thanks (as always) for your kind comments, Gail! OMG Audrey, you have out done yourself here! What an awesome and comprehensive travel hub. 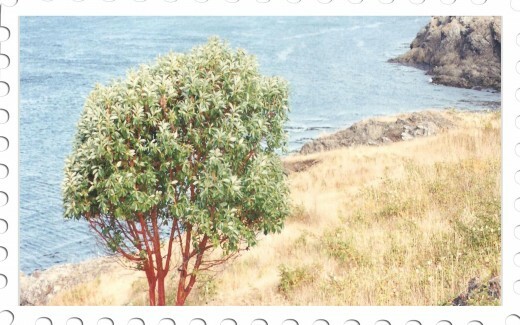 I love the way you made the stunning photos into post cards and collages. This definitely sounds like my idea of a great vacation. I really do have to explore the Pacific Coast one day, especially in the Northern Region. Thanks for stopping by orioleorange - enjoy the great environment in Seattle! Thanks for the info.! Very informative... I will be moving out to the Seattle area soon, and this is definitely something I'm excited about! Thanks for taking the tour, James! Thank you for this journey to the San Juan Islands. I enjoyed it and you were quite thorough. Thanks for the read, Crewman - we did do a lot more traveling when we had kids. Now with the malamutes, it's hard to find a spot that they like! ha ha Seriously thinking of going somewhere in the next few months and gotta find a spot that is Griffin friendly! You are such a traveler! I'm just an old stick in the mud, and usually happy about it. You make me want to see new places. Good writing. Thanks, Prasetio for your kind comments as always and you are right - there are not enough words to describe this beautiful place. I was so privileged to go there and visit though most of our trips were just day trips but it was well worth the drive! Thanks again for being a fan. I love to see this place in person. What a beautiful Island. There are so much fun in this Island, even I can't mention this one by one. I really enjoy all the pictures and the video. I don't have much word to say, because this is so beautiful. Good work, Audrey. Vote up as always. Thanks Micky - and funny thing is I can see you pedaling NONSTOP on Orcas most especially. 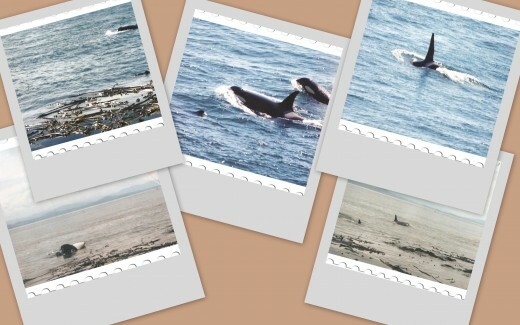 The Orca whales do visit around Orcas but they 'usually' stay on the west side of the island! Thanks for the poke! ..the best vacation destinations are your hubs - and quite a few of them make my hungary too - the best idea might be to turn them into a bed and breakfast - because you're a wonderful gracious host! You are so good at these travel hubs! Go GIRL! The Orcas Island must have some Orcas around. Poked those buttons up! Thank you Ma'am! I'm sorry you didn't see it (yet) Sandy - maybe another time! All those years that I lived in the great Northwest. I had never been to San Juan Island. Beautiful area and hub. BJ - Thanks so much for your kind comments and kudos - I'm thinking of going into traveling counseling. I wish! Actually I'd love to just travel around and review every place I went - I would LOVE it. I just need to win the lottery first! Steph - Hope you do that! I love San Juan because of the Orca whales but I always love Orcas. Bob and I went there several times for romantic getaways and it was so beautiful. Of course, there's also Whidbey which is lovely - if I'd had more time and more arms, I could have kept on going forever! You too I have no doubt. Katie - Thanks - Thanks to Om, I remembered I had PhotoShop and just started messing around. Amazing program. San Juan Island is just amazing but actually all the San Juan Islands are. That's one reason why we're out in the sticks in Oregon....everyone has kinda sorta found out the beauty of the Northwest and Seattle became so crowded that after 23 years, we just couldn't take it anymore and now we are here, where cows amble across the road and repairmen take weeks to answer a call! Oh well - apples and oranges! We can always go back for a visit! Beautiful - there are guide books out there that don't do anywhere as thorough and nice a job as this. I really love the San Juans and though its far from Central Oregon now, my family lives in Seattle. We've got to get the kids out there again soon. Orcas is a gem, and Friday Harbor is just too much fun. Big thumbs up for another beautiful hub! You have enlarged my world, Audrea, with this magnificent hub. Until I read the above, the only San Juan I was acquainted with was the Caribbean one in Puerto Rico. You might want to consider a second career as a travel counselor at some time in the future. Your descriptions of the delights and attractions of SJ are inviting and alluring. Like their creator. Wishing you there - it is a lovely place to visit! We lived in the Seattle/Tacoma area for 23 years and it was just magnificent. 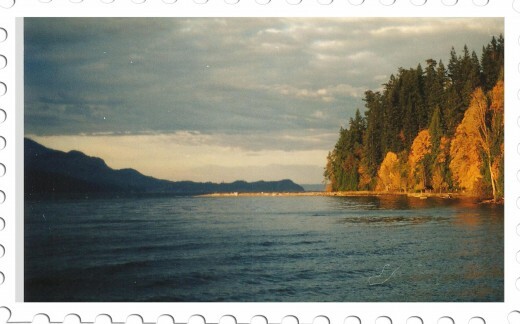 Wow, I'd love to visit San Juan Island someday! Fantastic photos, and very useful info! Dim - isn't that just the truth? I've heard the term about horses and all that but this pig must have really been the stud to spark a war! Ingenira - Thanks so much for the read - I don't know how I managed that shot but that trip I had my settings on the 35 mm a little 'funky'. It actually made for some great pictures though! Carolina Muscle - Thanks so much for stopping by and glad I could be informative! Sage - Nice to see you and glad that came through. It is another of my most favorite places! Alekhouse - Thanks so much and I wish you could too. It is a beautiful place and once you get there, you can still lay on the beach! Audrey, great hub, as usual. This looks so inviting. Wish I could still take trips like this. I used to, but now I'm more into lying on the beach. akirchner - You did an amazing job with this hub. You covered every aspect of what to see and do in this beautiful vacation resort. 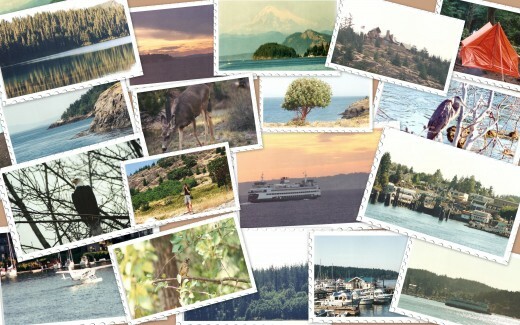 Your love for the San Juan Island in Washington shines through, througout this entire hub. 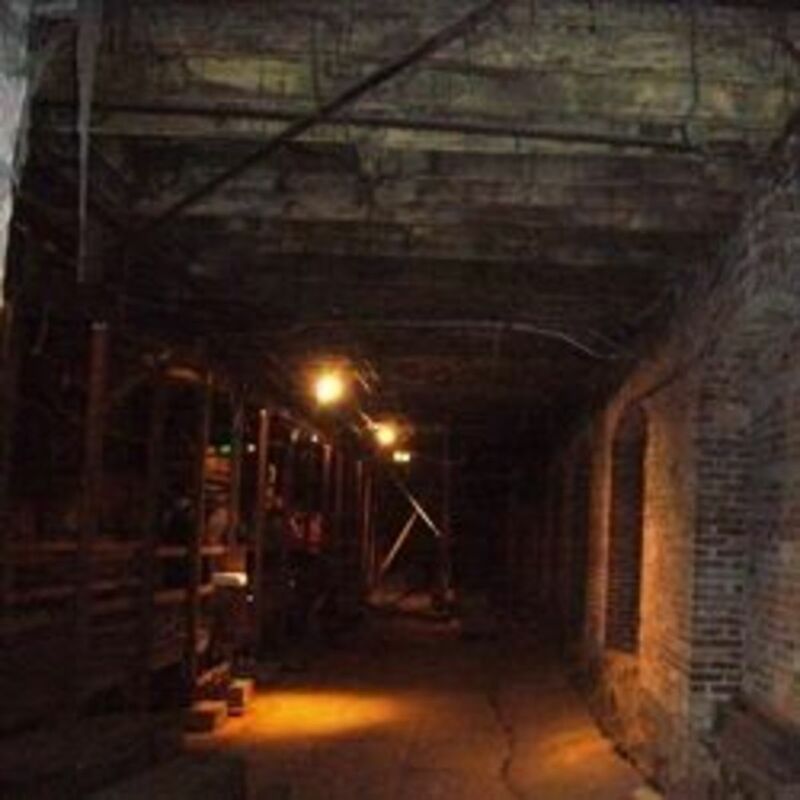 If I ever get out to Washington I will be sure to check it out. this is a fascinating hub about somewhere I never even knew existed... very cool !!!! A really nice place that I'd like to spend a week holidays on. The photo "whale watching spot just south of Lime Kiln Point" looked like a painted art. Great hub!